The island of Oahu is the most visited island in the state of Hawaii. Most people who plan a Hawaii vacation stay in or around Waikiki, which is a neighborhood of Honolulu. Oahu attractions range from natural sights like waterfalls, rainforests and beaches, to man-made attractions, such as museums, shows, historic buildings and temples. 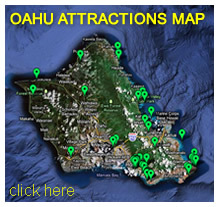 Oahu sightseeing is fun for people of all ages and interests since there is something for everyone. Below is a list of some of the best things to do on Oahu.